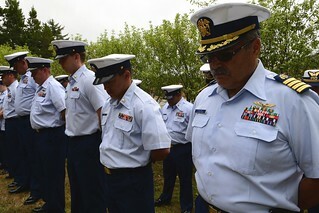 MCKINLEYVILLE, Calif. — Coast Guard Sector Humboldt Bay held a service Friday to honor the 20th anniversary of the sacrifice of four Coast Guardsmen who perished in the line of duty while attempting to save the lives of others. Coast Guard 6541, a MH-65 Dolphin helicopter, crashed in the early hours of July 12, 1994 near Shelter Cove, Calif., while responding to a sailing vessel in distress. When heavy pre-dawn fog made a visual approach impossible, the air crew performed several unsuccessful approaches to the sailing vessel, striking a shoreline cliff on the third attempt and taking the lives of all four crew members, Lt. Laurence Williams, Lt. Mark Koteek, Senior Chief Petty Officer Peter Leeman, and Petty Officer 1st Class Michael Gill. Williams, originally of Orlando, Fla., moved to Humboldt Bay in October of 1990 where he later met and married his wife, Wendy. A Coast Guard pilot for six years, he served with distinction as an aircraft commander, and was the unit training officer, public affairs officer and historian. He earned his B.S. degree from Arizona State University. Koteek, originally of Saugerties, New York, and his wife Karen came to Humboldt Bay in February of 1993. A Coast Guard pilot for three years, he served commendably as a copilot and as the exchange and food services officer. He was a U.S. Coast Guard Academy graduate. Leeman, originally of Oxford, Maine, his wife Darlene, and his daughter, April arrived in Humboldt Bay in August of 1991. Peter was a dedicated rescue swimmer and flight mechanic. He served as the chairman of the enlisted standardization board for aircrew training and was the aviation survivalman shop supervisor. He served 14 years in the aviation field, and was pursuing an associate’s degree at the College of the Redwoods. Gill, originally of St. Petersburg, Fla., and his wife Donna reported to Humboldt Bay in May of 1990. In December of 1991, they were blessed with the birth of their daughter, Audrey. Mike was a conscientious aviation mechanic who served in the aviation community for 14 years. He was a quality assurance inspector and an aircrew standardization board member. He was pursuing his associate’s degree at the College of the Redwoods. The ceremony included a bagpipe melody, helicopter flyover, and wreath-laying.